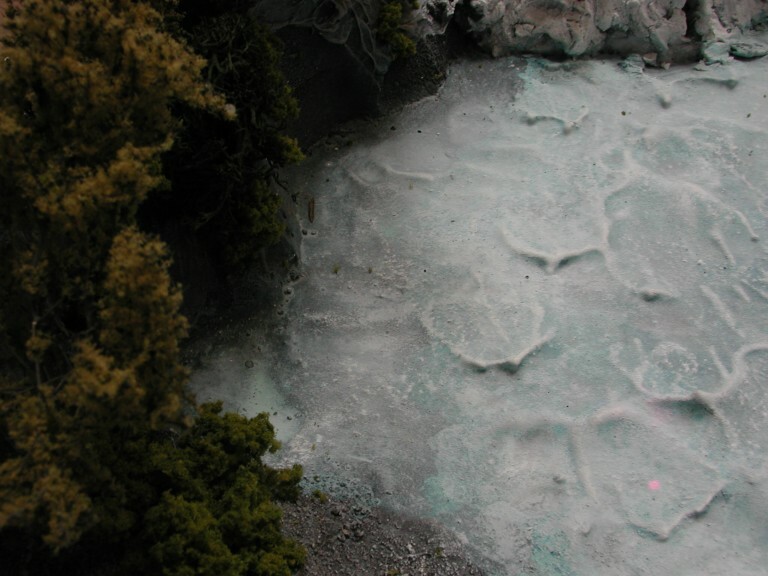 Next, I used Woodland Scenics Flex Paste to fill all the gaps and to add some texture to the cliffs. 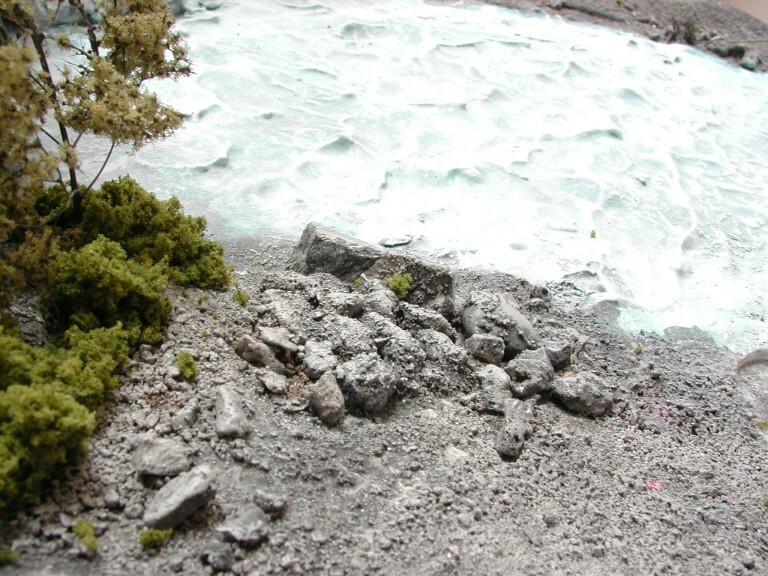 Using several grades of model railroad ballast and rocks I added the rocky shoreline. Start w/ the smallest ballast and cover the entire area. As you add the larger ballast and rocks add fewer and fewer and put the big ones closer to the water. We need to hide the wraiths bases. Before you pour the plaster glue the bases in place. 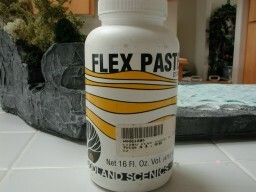 As you pour the plaster, it will run around the bases. 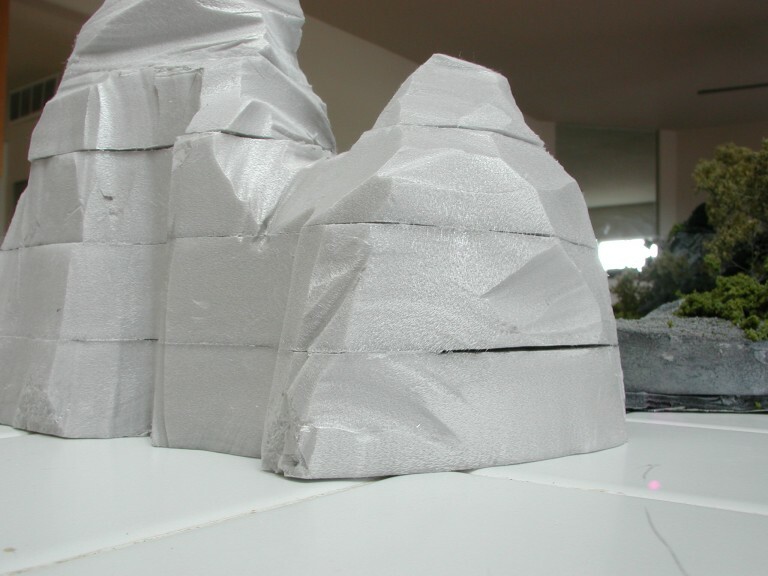 When it hardens, you can soften the plaster with some water to take them out for basing the wraiths. doesn't run everywhere. For something this large, I had to work quickly and made four pouring passes to cover the entire riverbed. While the plaster is setting, use the back of a spoon to shape the waves. The plaster will take 1-2 days to dry. 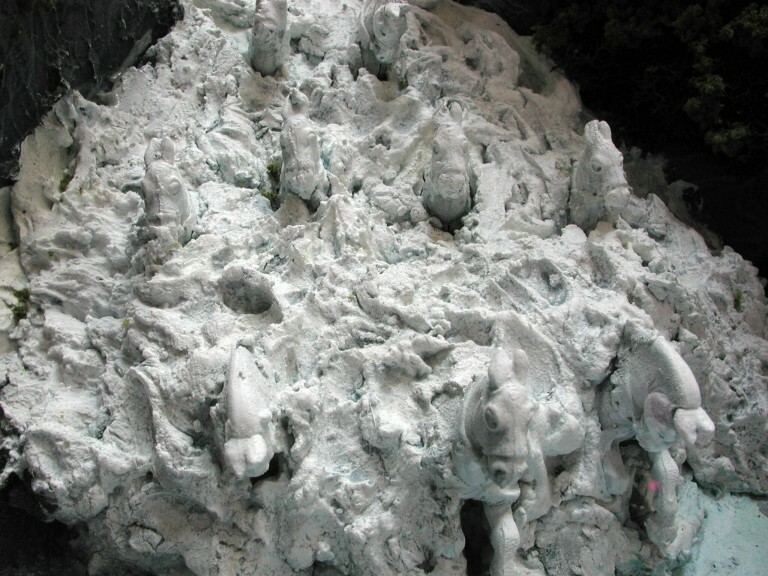 To sculpt the horse water I used a bunch of plastic GW horses that I had around and Woodland Scenics Foam Putty; the putty is very fluffy and seemed a good material to create a bunch of white water. 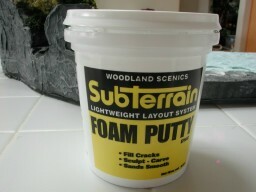 I put down one layer of the putty and "fluffed" it up. When it dried, I glued down one layer of horses. I added more putty to fill in between the horses. When this dried, I repeated the procedure to add 3 layers of horses total to give the horse water some height so that it'd feel like it was filling the ford. Now we can finally paint. First, prime the entire piece w/ Krylon White Primer. 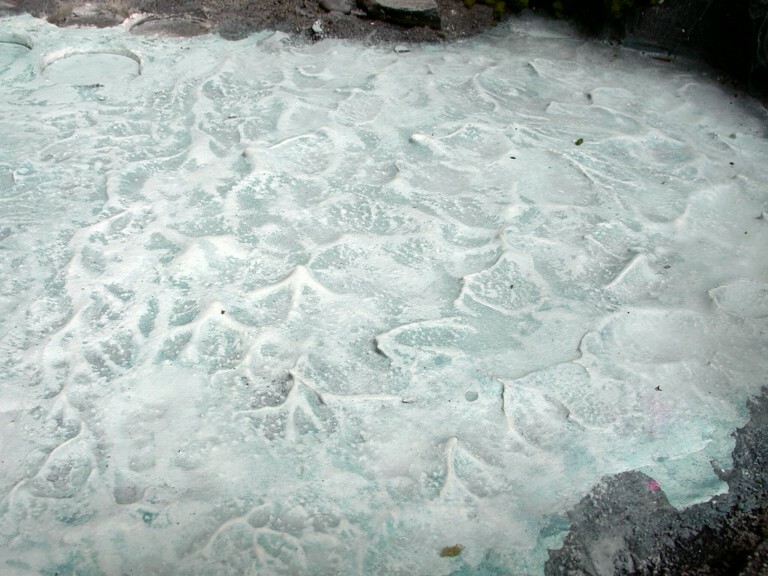 On the cliffs, it'll eat away at the foam a bit causing some randomness. I like this because you get a lot of little outcroppings here and there. Paint the cliffs & shoreline first. I used Vallejo Dark Grey as the base coat (I used a pretty thick wash). 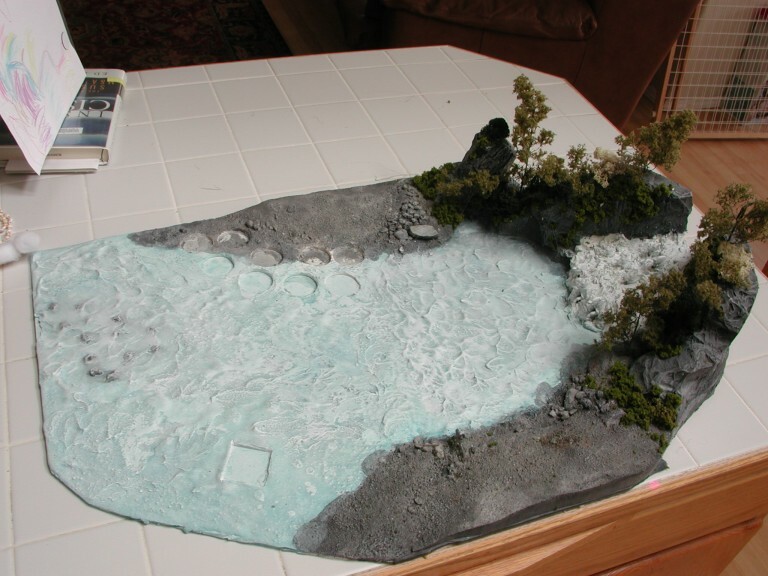 Also, make sure you get some of the dark grey onto the water to simulate the reflection of the cliffs in the water. Then it's several drybrushed, highlight layers ... Liquitex Basics Neutral Gray 5 is first ... then half-n-half mixutre of Neutral Gray 5 w/ Liquitex Basics Titanium White ... finally just some Titanium White. To paint the water, I used Vallejo Dark Prussian Blue and Reaper Sea Foam in 1:4 ratio w/ a milky wash to get the base color down. 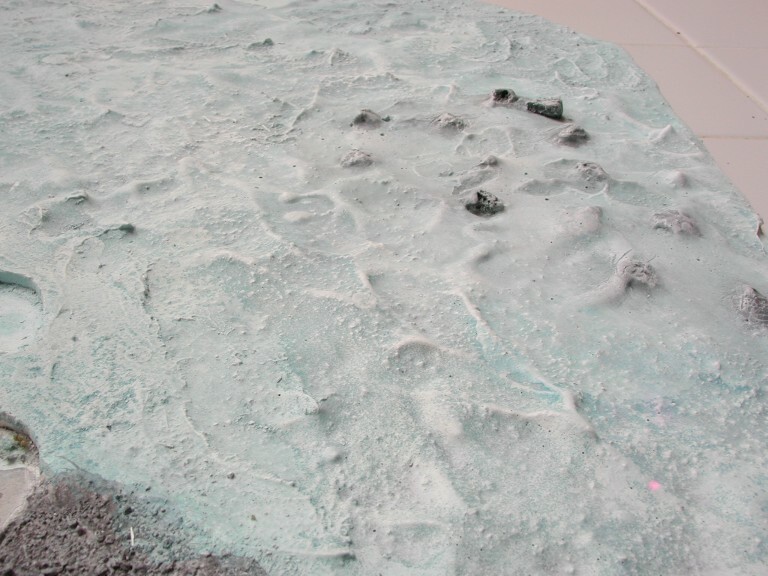 After this was dry, I used Ral Partha Slate (kind of a blue-grey) and a little Dark Prussian Blue in a very thin wash.
Once this was dry, several thin drybrushes of Titanium White were used to bring out the foam and crests. 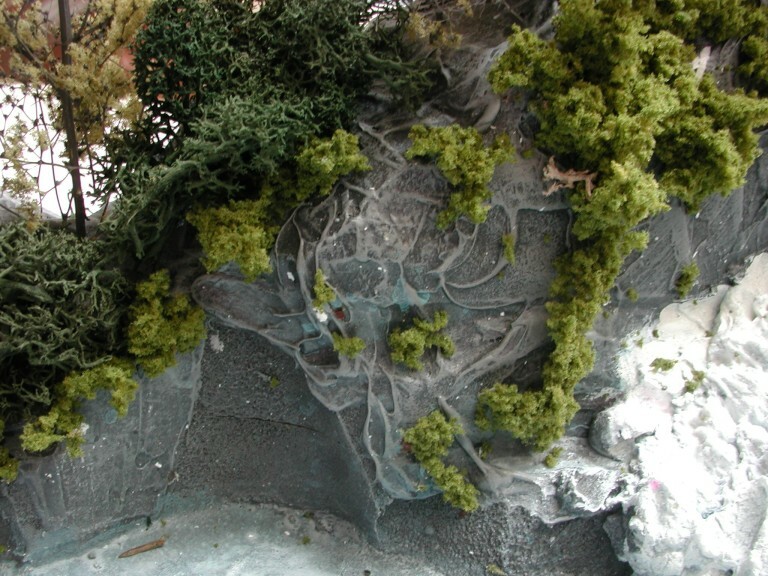 Now, I just took my favorite model railroad / woodland scenics stuff and just started gluing it down. Start w/the ground cover first and slowly work towards the taller pieces. 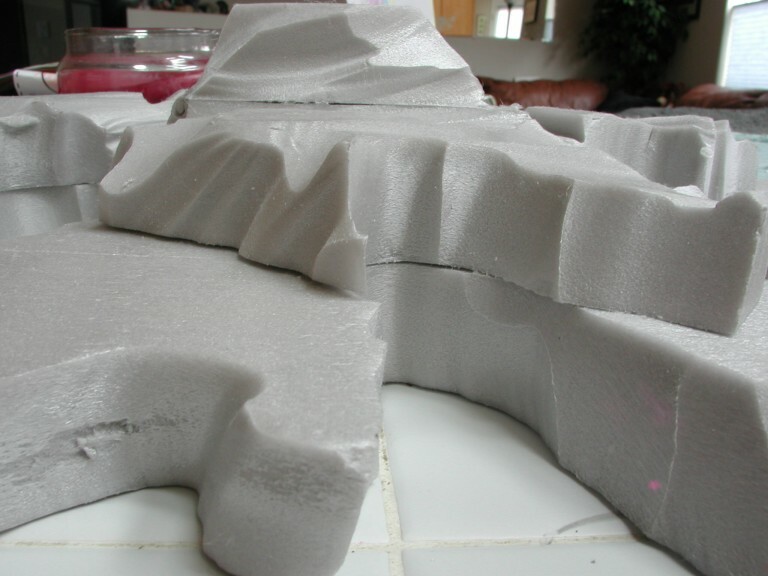 For the trees, you can use a file (or other sharp pointed object) to make a hole in the cliffs (because they're made of foam this is quite easy) for the trunk of the tree and they'll glue (and hold) nicely. So, how do you paint these really dark creatures w/out just painting them black and thus leave them w/ absolutely no character what-so-ever? I always prime my figs w/ Krylon White. For the riders; First a Vallejo Black & Dark Prussian Blue 1:1 mixture washed over everything. Now, both riders & horses get about 3 thin washes of Vallejo Black to slowly add darkness. Now, a little Vallejo silver was drybrushed on the riders armor & the horses metal. Now, just a little filing on the holes. 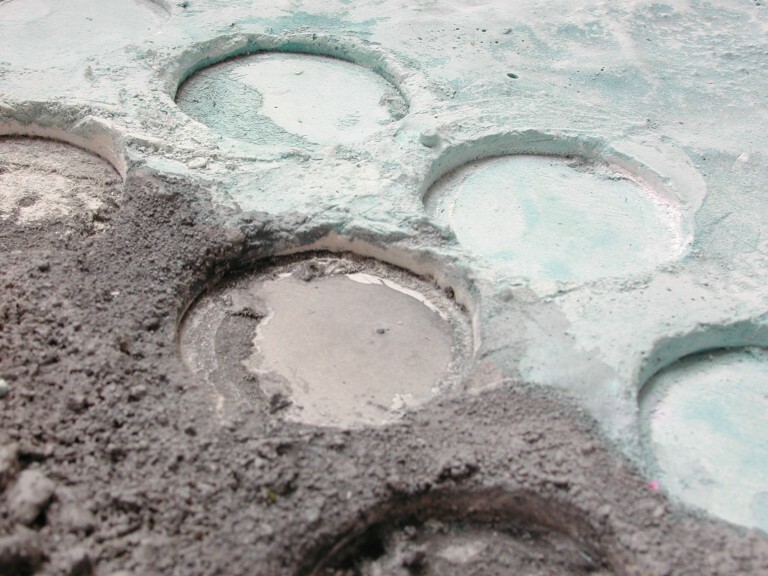 Because the GW bases are beveled, you'll need to run a file around the holes to make them just a bit larger and to remove any grit that got in the holes when we poured the water and built the shoreline. 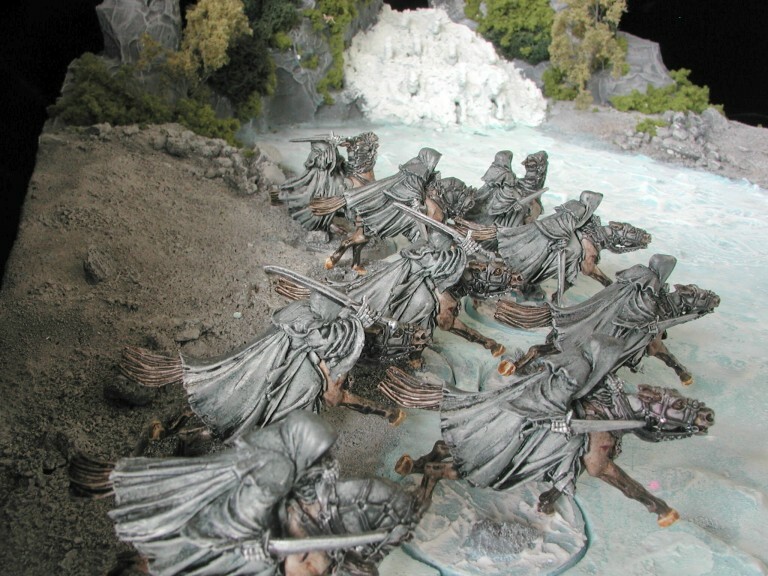 As you can see the ringwraiths were each based with regard to their position along the shoreline so that some are all water and others have the shoreline running through their bases to make sure they didn't disturb the shoreline. 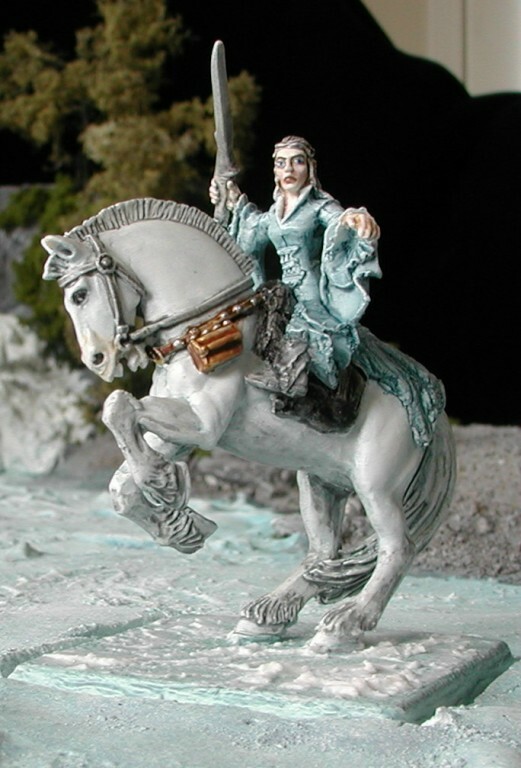 The Arwen fig required some pretty serious alterations to ride the GW Balthsar Gelt horse. I added some skirts and a saddle w/ epoxy putty. Arwen's flesh is Vallejo Light Flesh w/ a thin Reaper Flesh Ink wash and a little Brown Rose to blush her cheeks. 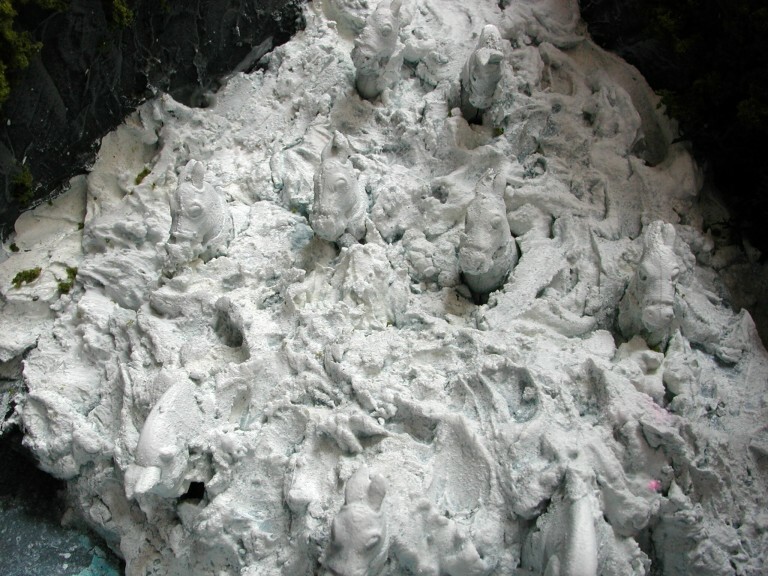 wash; the horse is Blue Grey wash, a London grey wash, and several layers of thin white highlights. The nose area gets some Basic Skintone. The gold on the horse is Vallejo gold (thin wash) followed by Reaper Flesh Ink Wash. Vallejo silver on the studs. Dark Grey wash, then Black wash, over the reins & saddle. 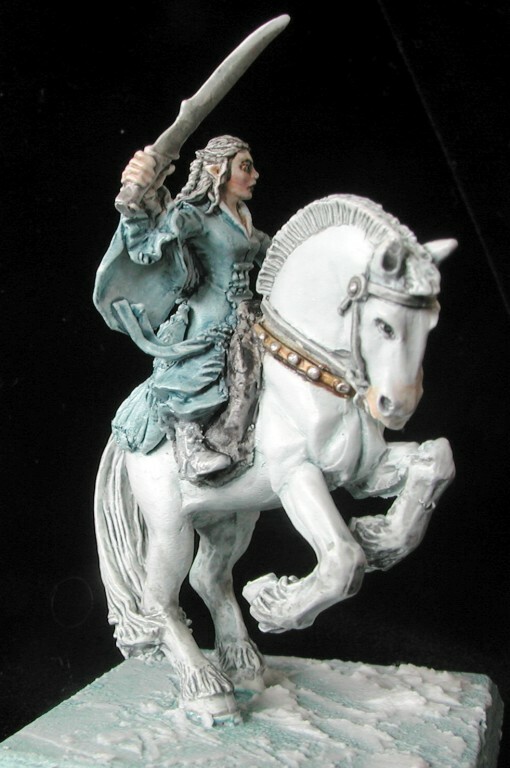 The sword was London Grey wash then Silver Grey and White very thin drybrushes to give it a polished metallic look. 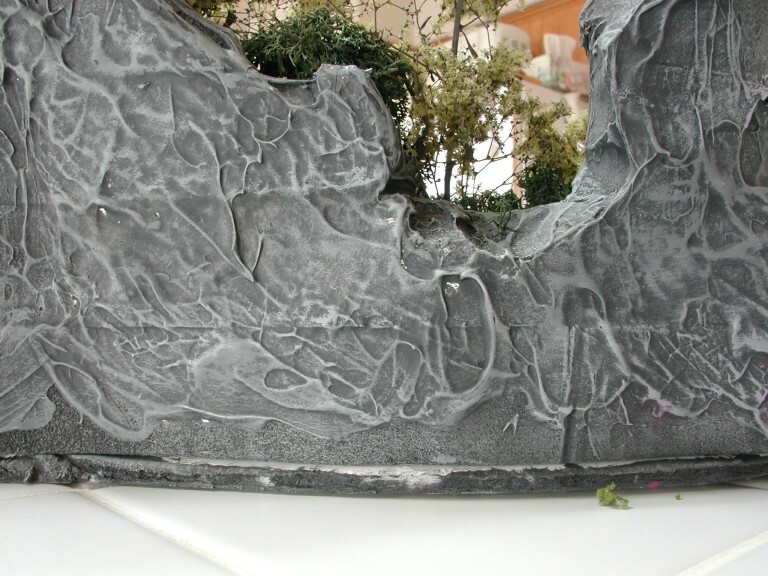 Foam putty was used to make the white water on her (and the wraiths) bases. Finally, all of the pieces have come together. This is my favorite shot ... if you're in the right mood, it almost looks like it might be a still from the movie.